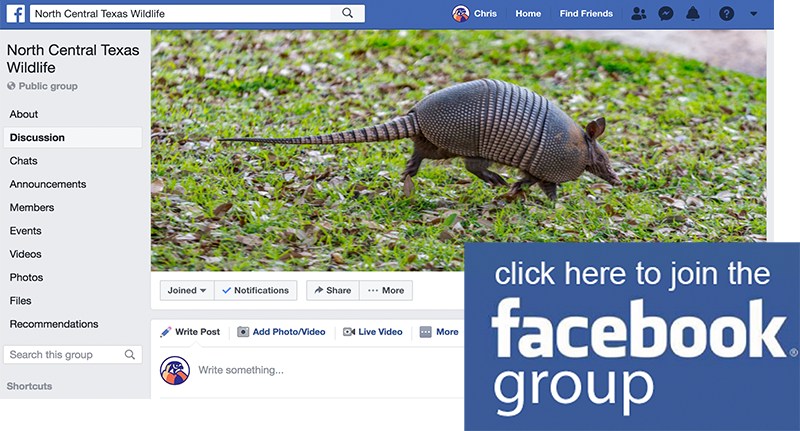 Way back in April of 2015, we launched the DFW Urban Wildlife Facebook Group. 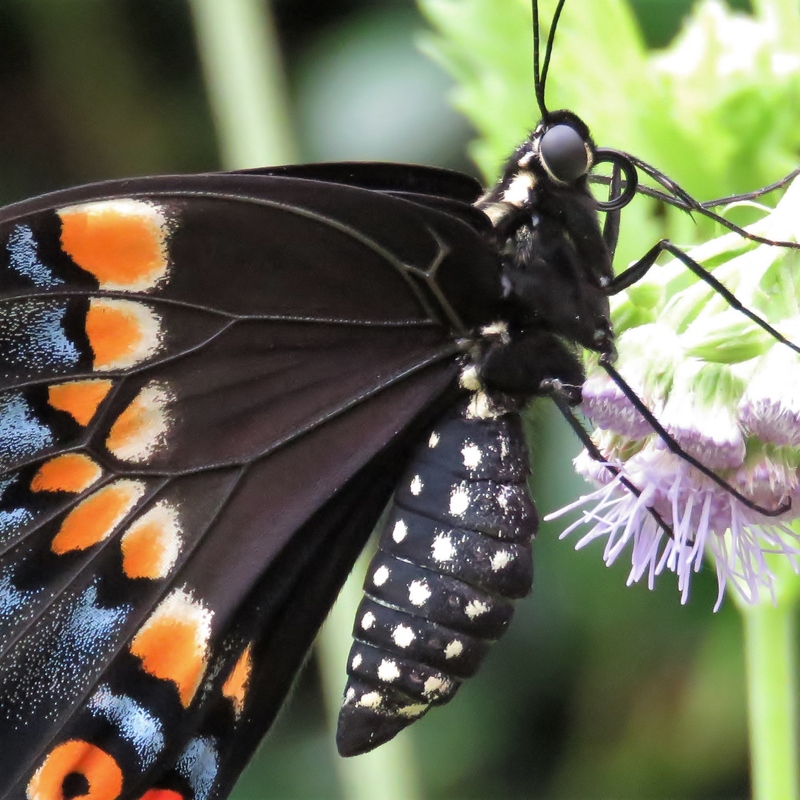 Over the years our members have contributed an astounding array of interesting anecdotes and beautiful wildlife photographs. 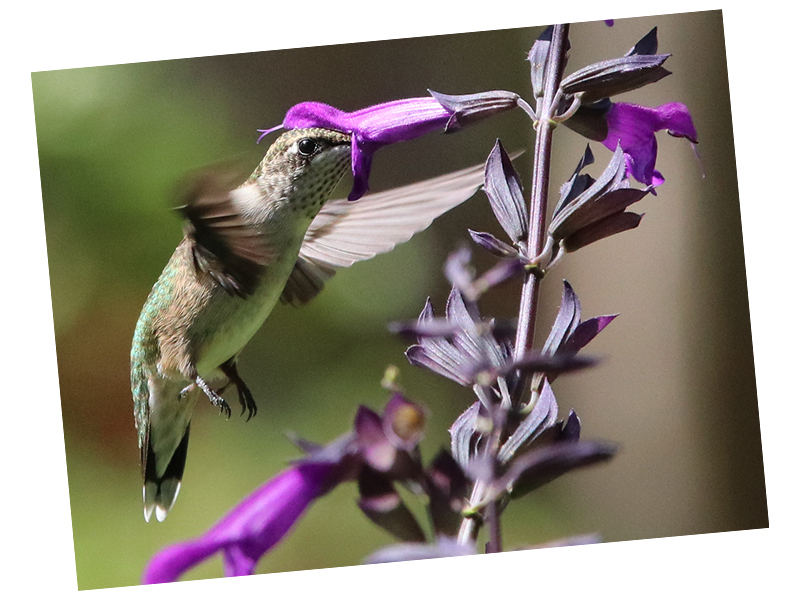 Together, we have collected an amazing amount of new and important urban wildlife data. This stuff is fun and interesting to peruse, but it also has significant educational and scientific value as well. What we do here has been noticed. 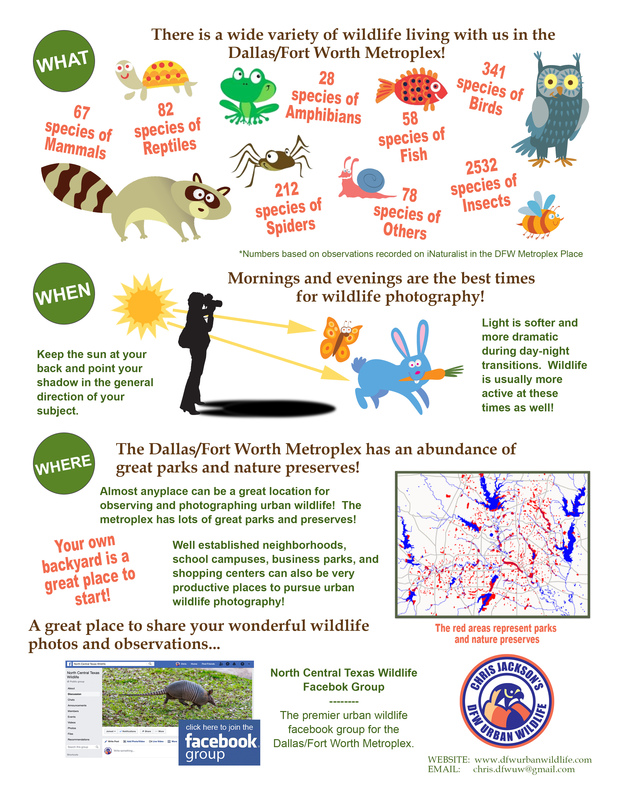 We are very proud of the community of naturalists we have helped foster here in the Dalls/Fort Worth metroplex. The number of people who participate is growing everyday! One of the things I have enjoyed the most about being involved in this pursuit is welcoming new people into our group. Few things have been as exciting to me as watching others come into our community of wildlife enthusiasts, and develop an interest in our common pursuit. I have watched as an ever increasing number of you have blossomed as well-informed naturalists and skilled wildlife photographers. Nothing could be more gratifying. 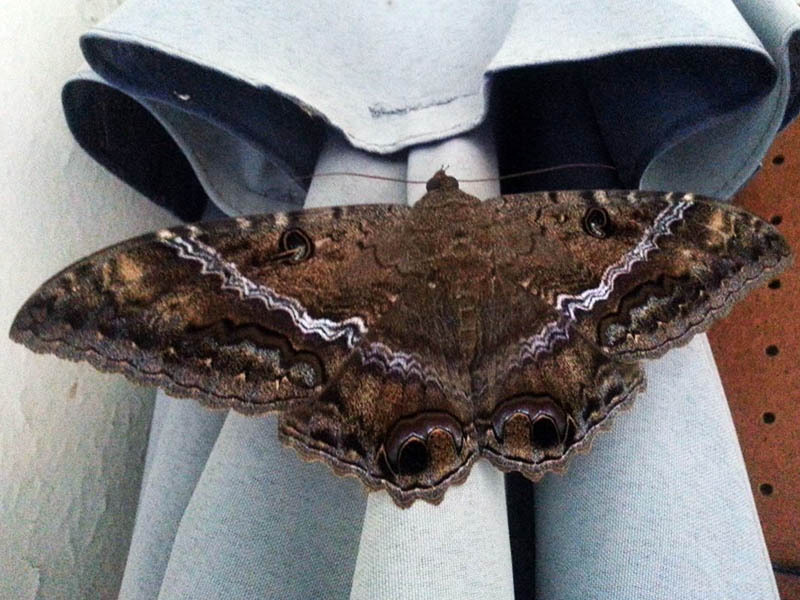 Wildlife photography, I think, is one of the best ways to indulge a budding interest in becoming a naturalist. Almost everyday I notice someone new taking their first tentative steps towards pursuing the hobby. I couldn’t be more excited to see this happen! Wildlife photography is a wonderful and rewarding endeavor in many different ways. But, wildlife photography is also an inherently difficult pursuit. Your subjects are typically uncooperative, to say the very least. Cameras and lenses come with a complex and intimidating array of switches and dials. More often than not you will be working at the very limits of what your photography equipment is capable of. 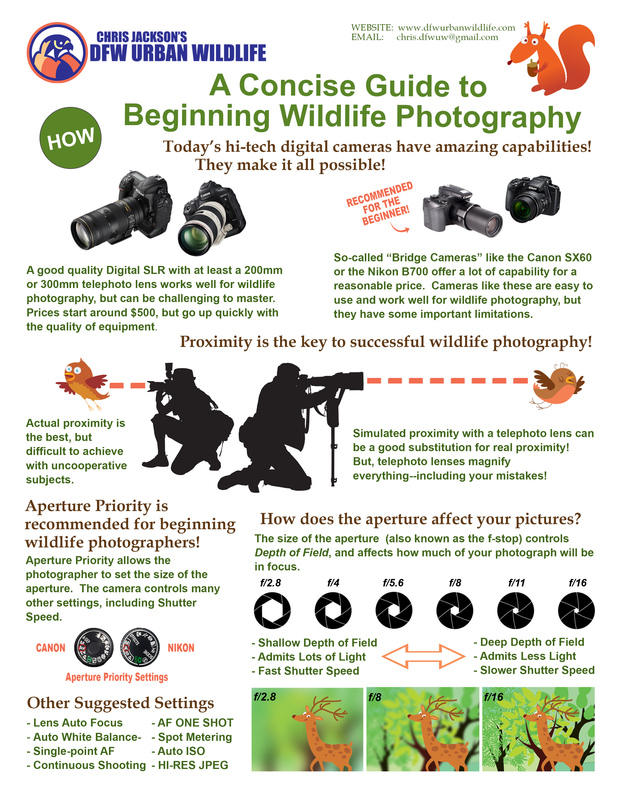 What that means is, that not only do you have to master your camera equipment, but you also need to develop a sophisticated understanding of wildlife, their habits, and the natural world they live. Finally, you must adopt a code of ethics that will help you pursue this hobby in a way that is respectful to the animals, nature, and other people. It’s a lot to ramp up on. Getting started in wildlife photography can be a daunting proposition. It is not an easy hobby, and beginners can easily become frustrated. 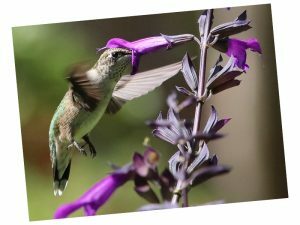 The purpose of this article is certainly not meant to sing the praises of my own abilities as a wildlife photographer (which are decidedly limited), but instead I want to communicate the joy I receive from engaging in this activity, and maybe encourage others to explore their own budding interest in this pursuit. perhaps I can share a tip or two that I have picked up over the years. Basically, I want to try and help you find a good place to start. 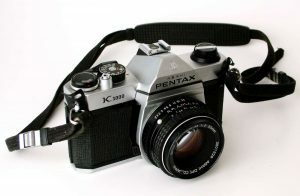 The intrepid and reliable Pentax K-1000. An antique. When I first got it in my head that I wanted to try pursuing wildlife photography (around 2003 or so), I started by digging through my closet in search of the old 35mm SLR I had used during my college days (even further back in time). 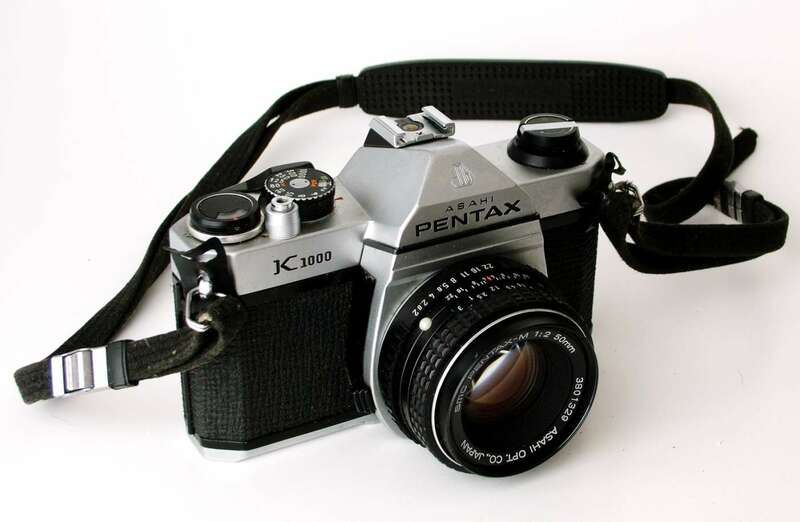 Soon I was dusting off my trusty old Pentax K-1000—one of the most basic and utilitarian 35mm SLR cameras ever built. It had been years since I last used this thing. A new battery returned the old Pentax to life, and a few pictures proved the camera was still in working order. Next it was off to eBay to find the least expensive and most over-promised telephoto lens I could find. My first attempts with this setup were abysmal. With a roll of film, you only have 24 chances to get it right, and evidently that was not enough for me. Everything that could go wrong, did go wrong. Bad lighting. Bad focus. Bad composition. It was all terribly disappointing. The lens had promised to be too good to be true, and it was. When you added in the cost of buying and processing film, these failures became quite expensive. 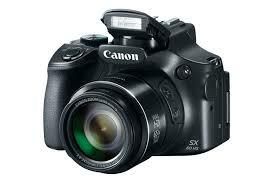 I started with my SLR because I thought that is what I was supposed to use. I thought a camera like that would be the only way to get professional quality results. But then one day—maybe out of a sense of desperation—I started playing around with my wife’s well-used Sony 2MP digital point-and-shoot. This little camera had produced lots of baby pictures… Would it work for wildlife photography? Digital wildlife photography, complete with a date stamp! The results with this Sony point and shoot were still not particularly good, but they were significantly better than I was able to achieve with the old Pentax K-1000. 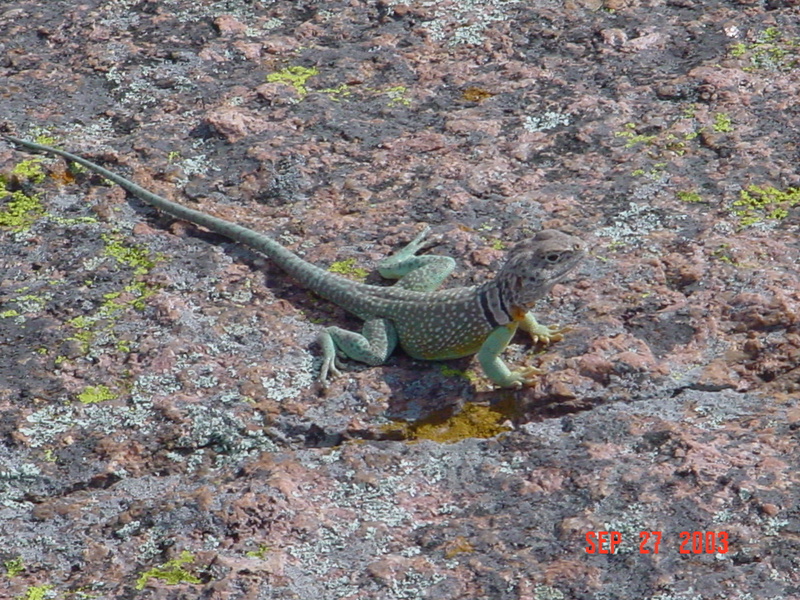 Further, the digital camera gave me some ability to instantly review my pictures in the field. With that, came the opportunity to make positive adjustments to the way I was approaching my picture taking. With the recognition that digital was a better way to go, I began shopping around for a Digital SLR that would be right for me. These kinds of cameras were pricey and I was a more than a little pensive about sticking my neck out on an investment that had no guarantee of paying off. After considerable study, I finally decided on one of Pentax’s earliest forays into the digital SLR market—a brand new *ist DS. This strangely named, 6 MP Digital SLR would work with my existing (but small) collection of Pentax lenses, so that was a plus. My old lenses helped me develop a certain comfort level with my new *ist DS, but it wasn’t long before I started looking for a something with a little more reach. This time I settled on a manual focus 300mm zoom lens. 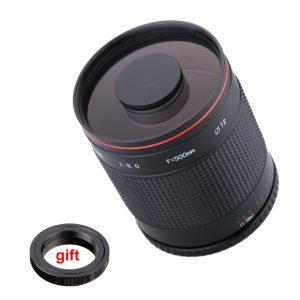 This inexpensive lens was better than anything I had before, but it was still not very good. It took me some time to realize that the focus I saw in the view finder was not the same focus that was represented on the camera’s sensor. I began to bracket my focus and take a LOT of pictures. My results began to improve. The first real test of this system came when I traveled to Denton to photograph the near mythical albino Fox Squirrel that was said to live there. I heard about this squirrel on CNN—that’s right, he had made national news! It was imperative, that if I was somehow able to locate this squirrel, that I would come away from the encounter with at least some decent pictures. 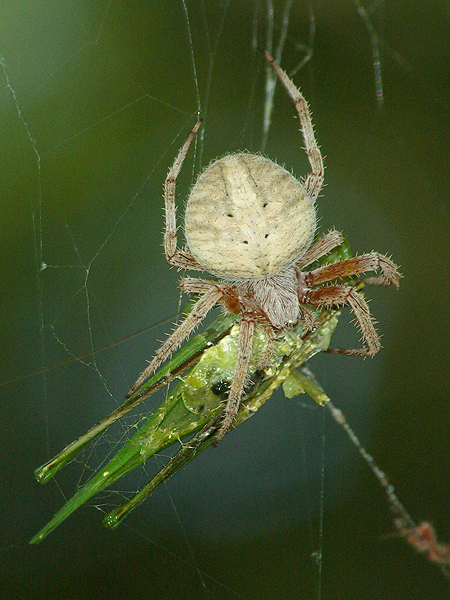 Well, I did find him, and I DID manage to take a few serviceable pictures. This was one of my first really positive experiences. It was very encouraging! The celebrity albino Fox Squirrel from Denton, Texas. The next piece of the puzzle fell into place when I finally ponied up and bought a good quality telephoto lens with auto-focus and image stabilization. With this change things finally started to come together for me. I started collecting more and better captures. With each success my understanding and enthusiasm improved. I started to explore more advance techniques for both photography and wildlife observing. Better equipment and improved technique! These days I’m generally pretty satisfied with the results I am able to achieve. I rarely pursue photography for the sake of art. My primary objective is largely to document the unique and unusual, and I’m typically able to accomplish the photographic goals I set for myself. In the field I use a spontaneous technique, photographing only what I happen to stumble across. It’s a method that relies heavily on serendipity. I usually shoot handheld, with the camera off tripod. I use safe generic settings that I judge will be best for the conditions before I ever venture afield. I will probably never be light enough on my feet to make sophisticated adjustments to my camera during the fleeting encounters I pursue. My preference is to get at least a technically competent photograph, with good focus, color, and composition. But, any picture that can effectively document an important observation is good enough for me. The following shots of Pileated Woodpeckers are a perfect example. Pileated Woodpeckers are large crow-sized birds that are rarely observed in the metroplex. 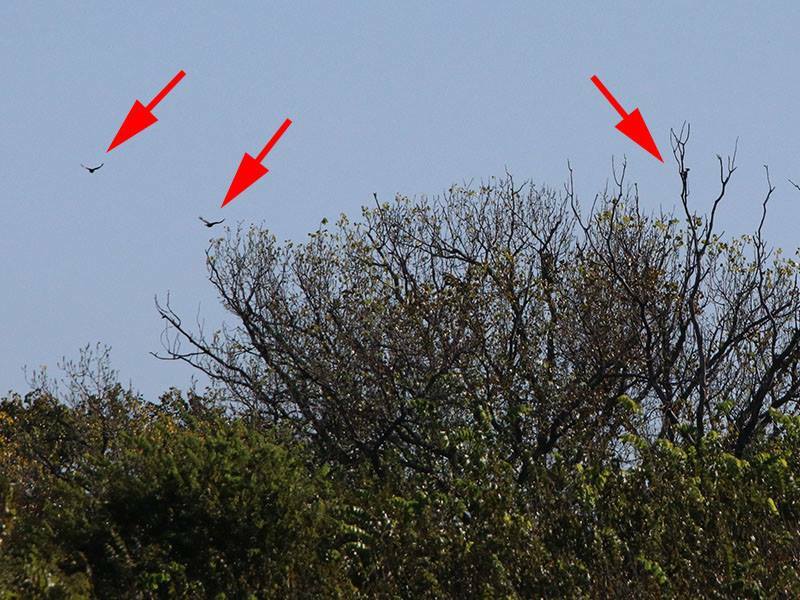 When they are seen, the observation is typically of a single bird and is very fleeting in nature. 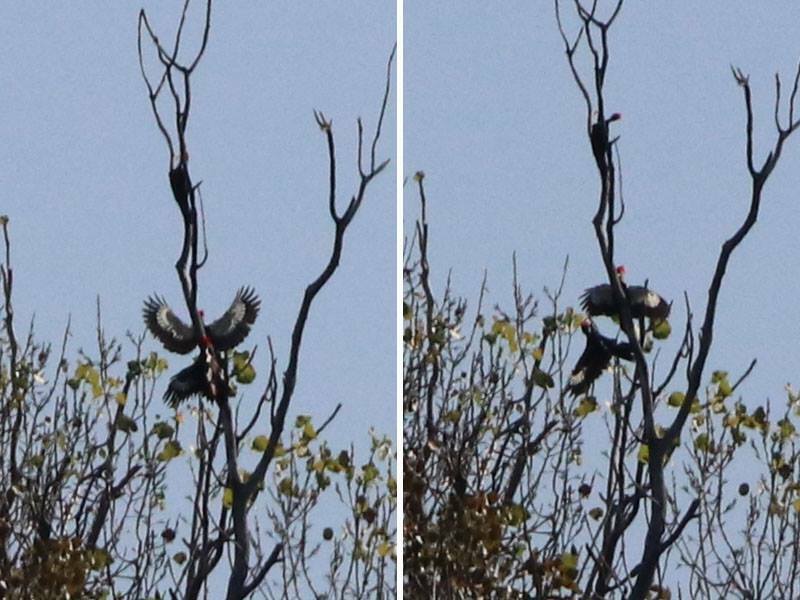 Well, one day last fall I was poking around in the Elm Fork bottomlands and I spotted three Pileated Woodpeckers chasing each other through the woods. A rare sighting indeed! But, on this morning, the light was terrible and the distances were great. As you can see, there is nothing artistic about these pictures—but they do effectively document what I saw. Sometimes, that has to be good enough. A slightly closer look revealing the important diagnostics. I am still a long way from what I would consider an expert, but on most days I am able to come away from the field with a reasonable collection of decent shots. More importantly, I am usually able to keep my number of glaring missed opportunities to an acceptable minimum as well, and that’s good enough for me! It’s been quite a journey. I’m certainly not going to try and make the case that I have arrived as a wildlife photographer—I still have a long way to go and a lot to learn. And, while I am not the best person to advise on the artistic photography many of you will be interested in, I do think my general technique is appropriate for most beginners because by its very nature it is easy to manage and produces generally good results. The Canon SX60 — Recommended for the beginner! 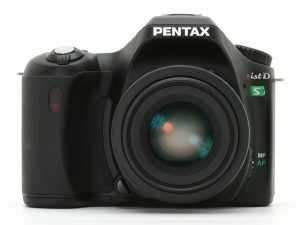 There are also some wonderful and extraordinary cameras on the market today that simply were not available when I was first getting started. These so-called “bridge cameras” come with powerful optical zooms that really work under most conditions. Cameras like the Canon SX60 and the Nikon B700 have amazing capabilities, and are affordably priced at just around $450. 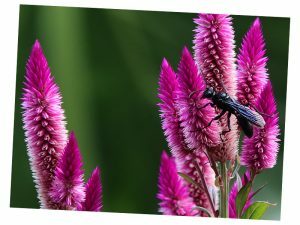 These cameras have some important limitations, but they give the beginner a real chance to achieve good results early on. I also suggest reading up on the subject. 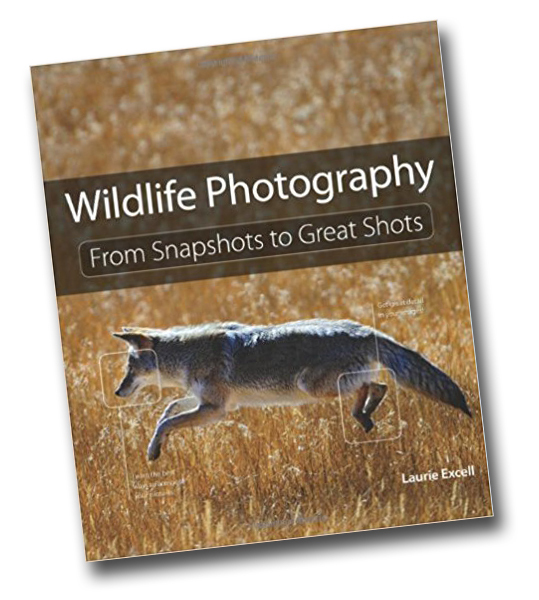 There are many good books on nature and wildlife photography. In particular, pay close attention to what these books say about the importance of good lighting! I’ve read many books on the subject of Wildlife photography. My favorite, and probably the most accessible of the bunch, was this simple book. It is concise, easy to read, and loaded with good information. Unfortunately, I don’t believe this book is in print any longer. If you can locate a secondhand copy of one, it is probably worth picking up. You’ll also need to pick a photo editing software suite and begin learning to how to use it. 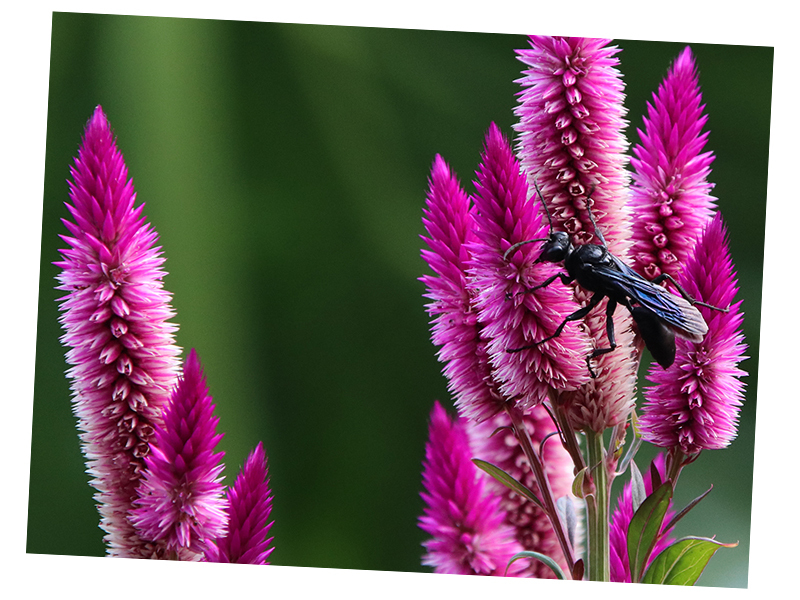 Adobe Lightroom and Photoshop are two popular examples. Learning curves are steep here too, but few minor adjustments can make the difference between a great picture and a throwaway. My advices is to start by tinkering with contrast and brightness. A little extra saturation can often punch up a picture as well. Maybe run your image through a sharping filter. And don’t be afraid to crop and rotate your images. Slight improvements to the composition can make an image so much stronger! 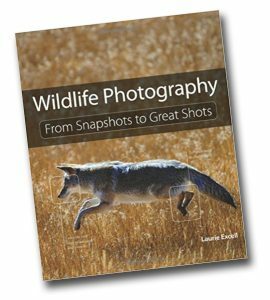 With wildlife photography, as with so many other aspects of life, sometimes all you really need is a place to start that you can have confidence in. Most of us can learn the rest and fill in the gaps as we go. That is what this guide is intended to be… Just a good place to start. Wildlife photography can be incredibly gratifying, but there can be a lot of frustration and disappointment associated with a day in the field that is not as productive as you hoped. Missed opportunities—especially where the rare and unique are concerned—can be crushing. But, it is the good days that keep you going… Sometimes even the just ok days will suffice. There’s nothing quite as satisfying as working hard for that really compelling photograph of one of your favorite critters, and coming back from the field with a shot that is spot on. Everyday in the field can become a learning experience which will improve your knowledge of your equipment and of your subjects. More than anything the key is just to keep trying. Sharing your pictures in places like our Facebook group helps to create a positive feedback loop that will encourage you to give it another go! We can’t wait to see what you have to share with us!